I am a sweet person…I am just not a sweets kinda person , if u knw what I mean! Presenting to you my first time ever gulaab jamun..(god only knows if I’ll every have the patience to make these babies again)!! 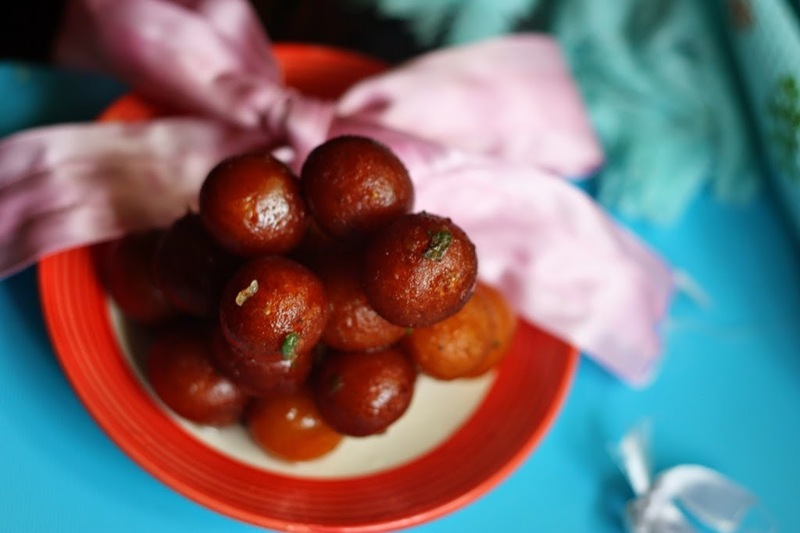 Serve warmed up on a cold day or cold on a hot day with a side of vanilla ice cream… Whatever the weather, however cranky your mood, these pretty lil gulab jamuns will cheer u up in no time! Mix the sugar and water and place over low heat, stirring till the sugar dissolves. Make sure it does not boil. Increase the heat once the sugar dissolves, and then bring mixture to a boil.Add some pistachios in the syrup. an optional step but it tastes good. Add the milk and water mixture and continue boiling over high flame, without stirring. Cook till syrup thickens a bit. Take syrup off stove and cool for a minimum of half an hour. Strain through a fine nylon sieve. 1/4 tsp baking , ghee..
With the heel of your palm or the base of a flat metal bowl, mash the khoya, so that no grains remain. Mix in the flour and baking soda and knead into firm dough. You can use a food processor too. The dough should be firm but pliable and should not feel dry. If it does feel dry, wet your hands and work the dough again. Shape the dough into marble-sized balls (jamuns) that are smooth and creaseless. The shape can be round or oblong. Please make sure there are no creases in the balls… also they will increase in size once fried and become even bigger after soaking up the syrup.. size the balls accordingly.. i prefer tiny lil ones…. Heat ghee or oil in the kadahi till a piece of dough tossed in comes up at once.Add as many jamuns as will fit in, without one touching the other. Keeping the heat low, fry these till a golden brown all over. 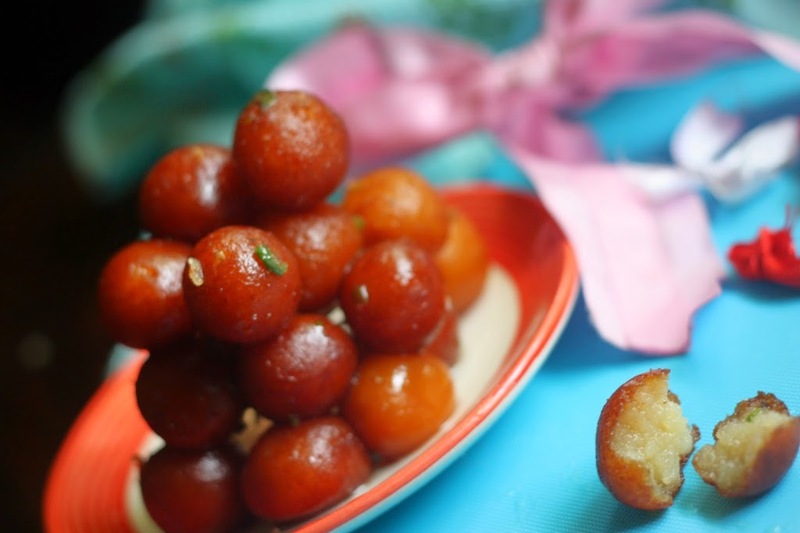 When the gulab jamuns are evenly golden and browned, remove from the slotted spoon and add them directly into the sugar syrup. 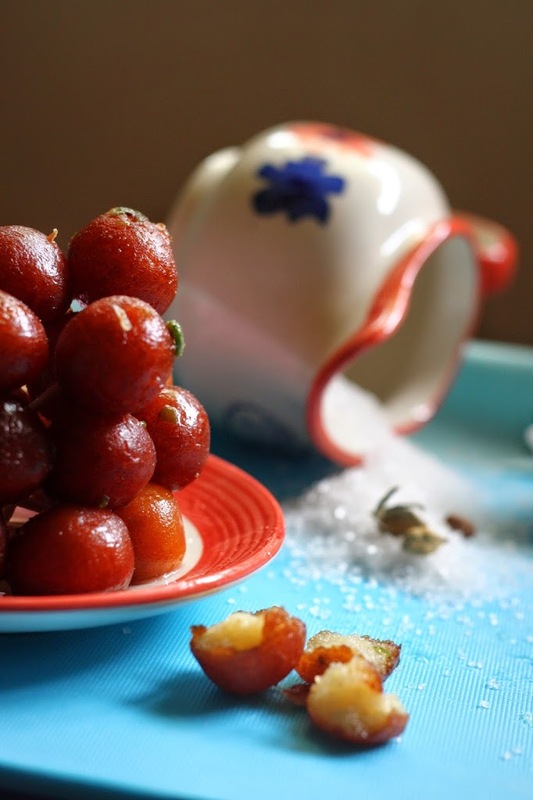 Keep the gulab jamuns in the sugar syrup for atleast 1-2 hours before serving. 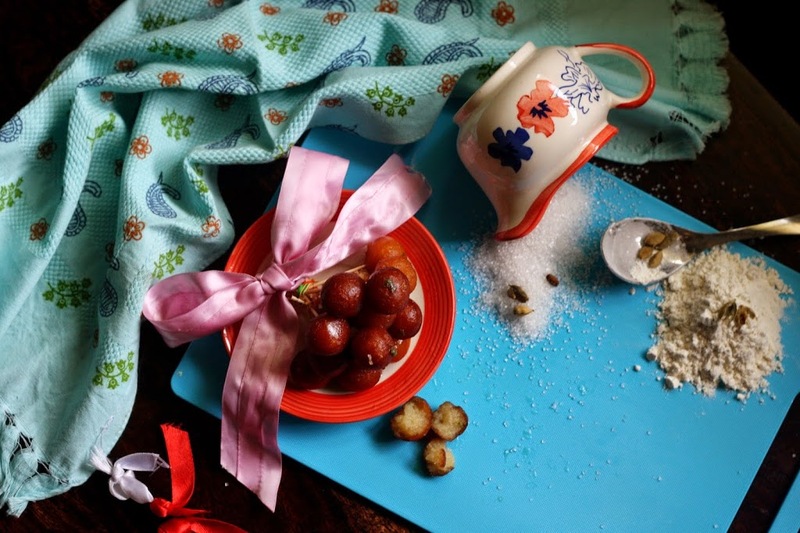 This is done so that the gulab jamun soaks up the sugar syrup which will make the insides soft and sweet…. Sit back and enjoy your handiwork.. n yeah, if you can bring yourself to it, share it with some one you love!